Reuben Kadish’s “A Dissertation on Alchemy” (1937) endures, in need of promised restoration, inside the shuttered Spanish Colonial Revival-style buildings at 55 Laguna St., the original site of the San Francisco Normal School, later the San Francisco State Teachers College, ancestor of San Francisco State University. 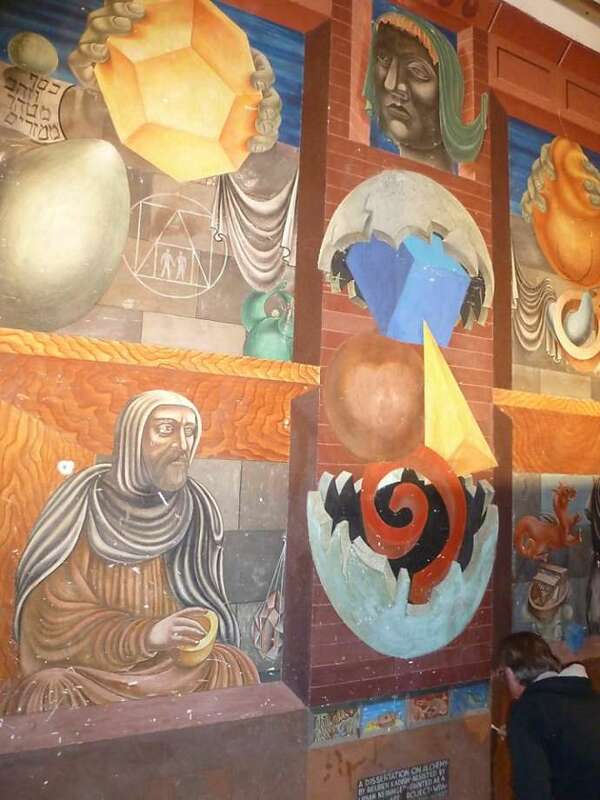 With the imminent demolition of a UC Berkeley Extension complex, a significant and long-endangered Depression-era mural in San Francisco – prized by preservationists and art historians but out of public view for a decade – appears to have been saved. Barring any hitch in the permit process, demolition of the 55 Laguna complex is expected to begin in a matter of weeks, leading to its replacement with 440 dwelling units: 330 market rate and 110 affordable, intended for seniors. The Kadish mural is in what will be the market rate housing area, originally the Woods Hall annex, which will also incorporate a new community arts center. Kadish (1913-1992), who grew up in Los Angeles, where he studied art – counting among his friends Jackson Pollock and Philip Guston – produced the allegorical fresco under the auspices of the Works Progress Administration. He subsequently headed the WPA’s Federal Art Project in Northern California, complaining in retrospect that the agency cared more about paperwork than artwork. In addition to its entombment in a disused building, “A Dissertation on Alchemy” suffered defacement by graffiti, possibly at the hands of squatters who have managed to shelter in the complex at times. UC hired Bay Area art conservator Anne Rosenthal to assess and correct the damage in a preliminary way. In a 1992 interview for the Archives of American Art, Kadish recalled the conservatism of San Francisco committee men, led by architect Timothy Pflueger, who had to sign off on his mural proposals. “I did 20-odd designs for murals, and only one of them was accepted,” said Kadish who, along with Guston, apprenticed to the celebrated Mexican muralist David Alfaro Siqueiros. There are other murals and mosaics within the complex that UC Berkeley took over in 1958 to serve as an extension for adult and continuing education programs. Site-specific works by less remembered artists such as Hebe Daum and Maxine Albro will also be restored. In 2003, the university, which retains ownership of the 5.8-acre property, deemed the seismic retrofit and maintenance the building needed impractically expensive. 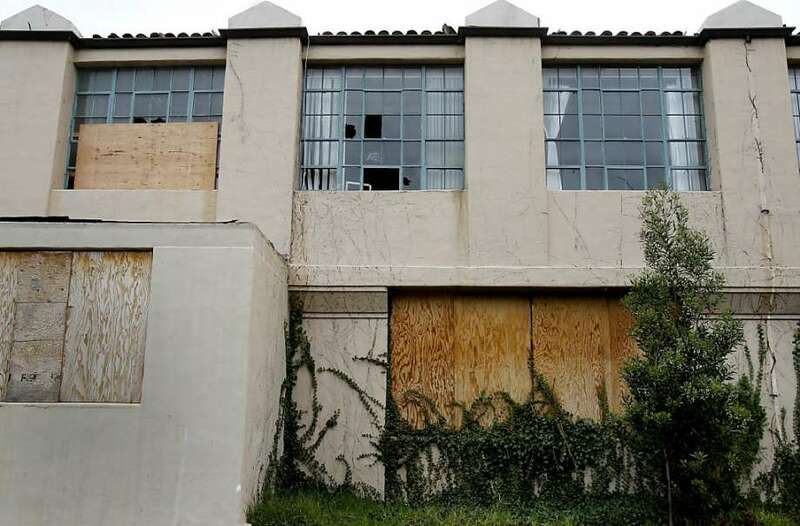 Wood Partners, with headquarters in Marin, bought the rights in 2010 to negotiate a long-term lease with the university – 75 years for the market rate side, 99 years for the senior housing portion – after the original developer, A. F. Evans, went bankrupt. Tovey Giezentanner, the development project’s community liaison, estimates that the market rate side will take 24 to 27 months to complete, with the affordable segment about a year behind that, because a combination of federal, city and private funding will pay for it. The developer is contractually bound to secure the Kadish mural during the course of the project. And “conservation treatment is typically the last piece of work following construction,” Rosenthal said. So anyone who wants to see “A Dissertation on Alchemy” in anything like the state Kadish intended still has a long wait ahead.